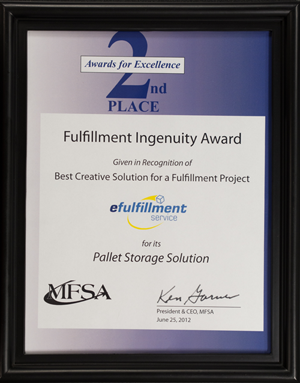 Awarded by the Mailing & Fulfillment Service Association (MFSA), the national trade association for the mailing and fulfillment services industry, the Fulfillment Ingenuity Award was given to eFulfillment Service in recognition for its creative pallet storage solution. For over 90 years, MFSA has been working to improve the business environment for mailing and fulfillment companies. The Fulfillment Ingenuity Award is part of the MFSA’s Awards for Excellence, designed to honor the best and brightest in the mailing and fulfillment services industry.